We don't just supply parts, we think outside the box. 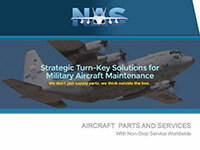 Militaries that operate USA origin aircraft rely on NAS for much more than aircraft spare parts. NAS’s services commence at the planning stage and never stop until the aircraft is returned to service. Located in Los Angeles, USA, NAS has been in business for more than 25 years. NAS’s turn-key “nose to tail” maintenance support solutions make NAS the ultimate choice for militaries looking to save time, money and manpower. Rely on NAS for non-stop service worldwide. We’ve broken the parts barrier and taken military aircraft maintenance support to a whole new level. Our accredited Quality Assurance Program ensures that our customers get the highest quality, airworthy parts they rely on. Contact us to customize a maintenance program for your organization.